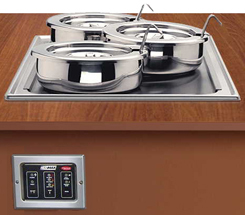 Special "Anti-Drip" pan allows the water, sauce, and condensation to flow to the pan. Four different accessories for soup kettle, sauce and food warmer, steamer, and pasta cooker. Self drain for easy cleaning and maintenance.